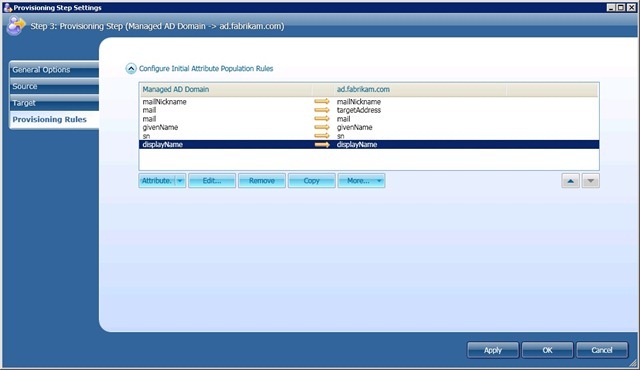 Posted by admin on January 6, 2011 at 1:35 am under Active Directory, Exchange Server, GAL Sync, Windows Server 2008 R2. 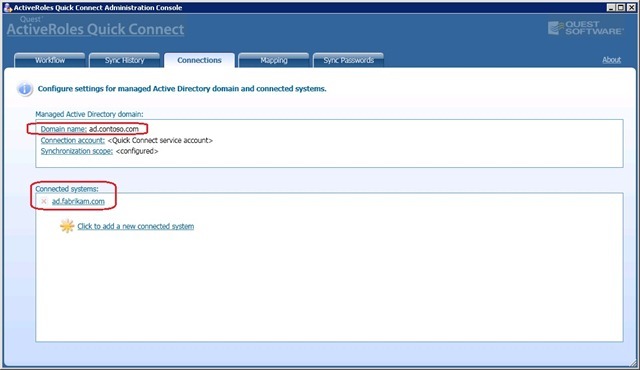 Quest has just released a freeware product called Quick Connect Express for Active Directory. If you’re looking for something that fills the gap left by the (now pensionable) Microsoft Identity Integration Feature Pack, then this may well be it. I’ve spent the last day looking at the product’s capabilities for running Exchange 2010 Global Address List synchronisation and I have to say I’ve very impressed. Aside from the price tag ($0.00 suits the pocket of most), the best thing about QQCE is that it’s really easy to set up and configure. I chose to install the software on a Windows Server 2008 R2 Standard Edition machine together with SQL Server 2008 R2. QQCE uses SQL databases to store the synchronisation data, but SQL Server doesn’t need to be on the same machine. My first forest (ad.contoso.com) runs Windows Server 2008 R2 functional level and has Exchange 2010 SP1 RU2. The second forest (ad.fabrikam.com) has the same versions. I joined the server running QQCE to the CONTOSOE domain, but it could equally have been joined to the FABRIKAM domain. I then configured GAL Sync in the direction CONTOSO –> FABRIKAM. In other words, I had users in CONTOSO that I wanted to appears as Contacts in the FABRIKAM Global Address List. Of course it is also possible to perform two-way GAL sync with the tool – I just didn’t take it that far. 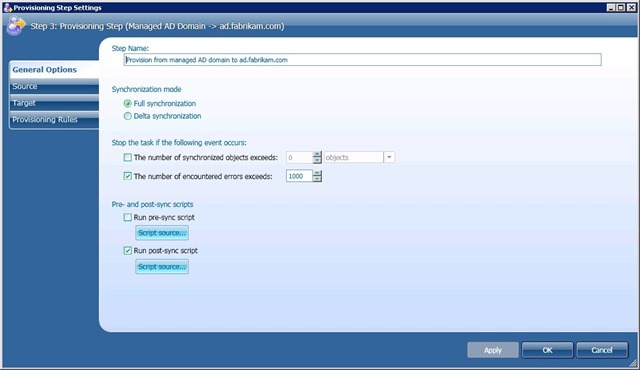 Once you have completed the installation, the first thing to do is select one of the two domains as the “Managed Domain” for QQCE. For the purposes of GAL sync the selection is arbitrary. 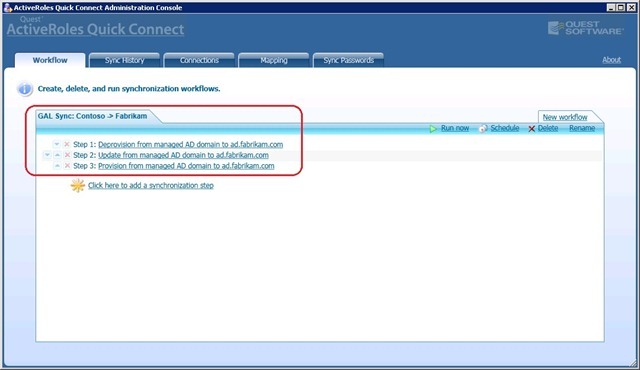 You then configure the second domain as a “Connected System”. You then need to set up the workflow. I chose to configure three separate workflow steps for the GAL Sync (Provisioning, Update and Deprovisioning). 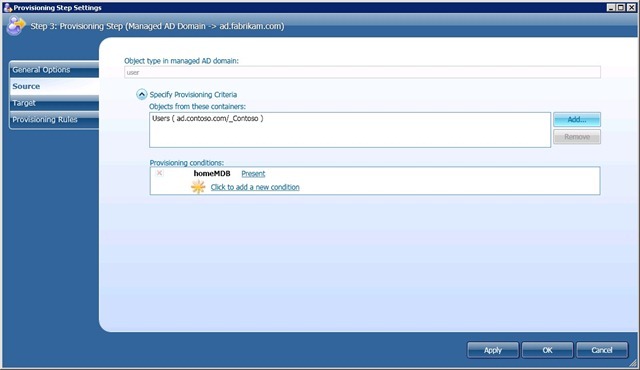 This ensures that any creation, modification or deletion of mailbox-enabled users in CONTOSO are reflected in FABRIKAM. The provisioning aspect of the workflow requires the most work. 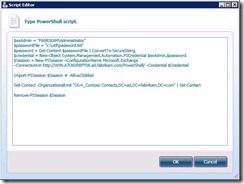 The tool can easily be configured to provision Contact objects in the target, but a custom post-sync Powershell script is required to ensure the contacts appear in the GAL. 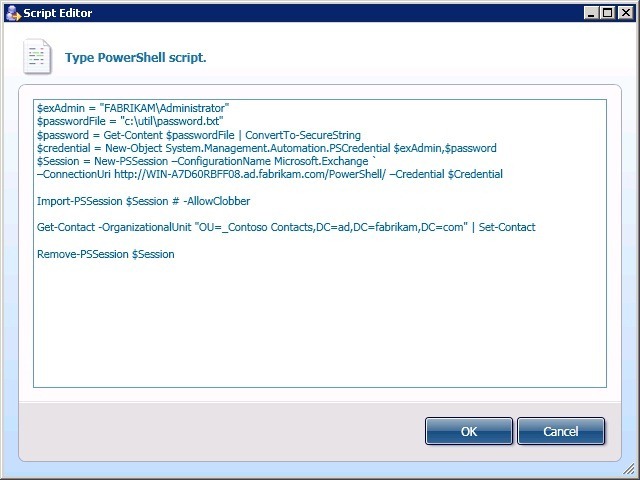 My script (which you can download here) invokes a remote Powershell session against a FABRIKAM Exchange server and uses the Get-Contact and Set-Contact cmdlets to ensure the attributes required for GAL visibility are stamped on the Contact objects. When configuring the Source information, I specified the OU containing the mailbox-enabled User objects and identified them using the homeMDB attribute. If the homeMDB attribute is present on a User object you can assume it is mailbox-enabled. 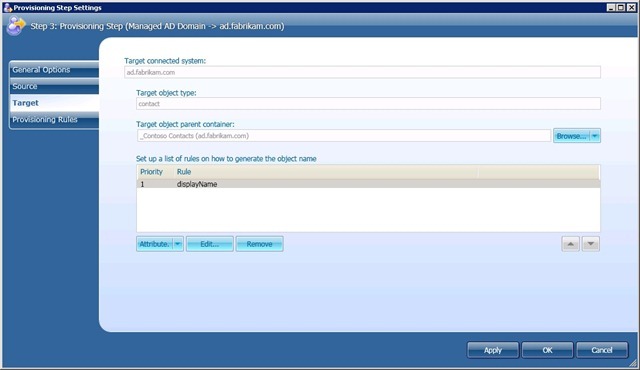 The Target window in the configuration wizard allows you to specify what object type to create (Contact in my case). You also specify the rule(s) for generating the object name. I chose the source User object’s Display Name attribute to generate the name (cn) for the corresponding Contact object. Finally, you specify which attributes on the source object should be populated on the target object during provisioning. My choices are fairly obvious, but note in particular that I used the mail attribute from the source to create the Contact object’s targetAddress attribute. The targetAddress attribute is important for Contacts as it is the one Exchange uses for routing purposes. The Update and Deprovisioning steps are much simpler to configure, so I won’t show them here. Once the workflow setup is compete you can configure them to run according to a schedule that you specify. Once per day is probably sufficient in most cases. The remaining task is to create a mapping rule for the User->Contact relationship. This is required to allow the Update and Deprovisioning workflow steps to match the correct target object based on changes or deletions in the source domain. And that’s it really. You can pretty much have the whole thing up and running in an hour or less! Much kudos to Quest for pushing this out as a free tool. Of course GAL Synchronisation is not the sole purpose of the tool, but I suspect it’ll be the major drawcard for many organisations given its usefulness in migration and coexistence scenarios. The major alternatives for GAL Sync with Exchange 2010 are ILM/FIM and SimplSync, both of which cost money and, in the case of FIM at least, require a great deal more configuration effort. Posted by admin on December 23, 2010 at 12:55 am under Active Directory, Exchange Server, GAL Sync, PowerShell, Windows Server 2008 R2.